Our regular meeting day is the 2nd Wednesday of each month at 7:00 p.m. in the parish hall – all members of the parish/congregation are welcome and encouraged to attend. Minutes of vestry meetings will be available once they have been approved and posted here. 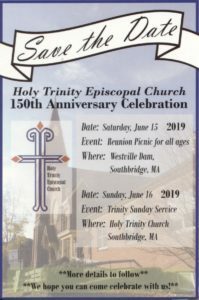 If you would like an electronic or paper copy please call or email Chris, our parish secretary: holytrinitysouthbridge@gmail.com 508-765-9559. Our goal is to be good stewards of our resources- time, talents and treasure -and to listen for and discern God’s call for us as we continue on our path towards God’s preferred and promised future. We work with the Buildings and Grounds Committee to prioritize repair and maintenance of our buildings.